We’ve been busy around here, tearing up the kitchen the last several weeks and having random items scattered all over the house because of it. Honestly, I’m not ready for next week to be Valentine’s Day. Not because we go all out for the day but because we have two birthday’s next week. Eek! Our youngest daughter will turn 8 on February 12th and our youngest of all son will turn 3 on Valentine’s Day. Yeah, I’m not ready for that. I’m hoping we’ll have our kitchen at least painted and maybe shelves up?!?! Maybe….? We’ll see. Truthfully, I don’t function well when my kitchen is a mess or in this case, torn up. Don’t get me wrong, I’m not complaining. I’m so grateful that my husband is doing such a wonderful job at making my kitchen dreams a reality. It’s really amazing, y’all, and I can’t wait to share it with a reveal when it’s done. I just don’t function well in messes. All kitchen messes aside, I’ll have to make 2 cakes (*cough* I might just buy them *cough*) next week and I might just do a simple dessert for Valentine’s Day, just because. 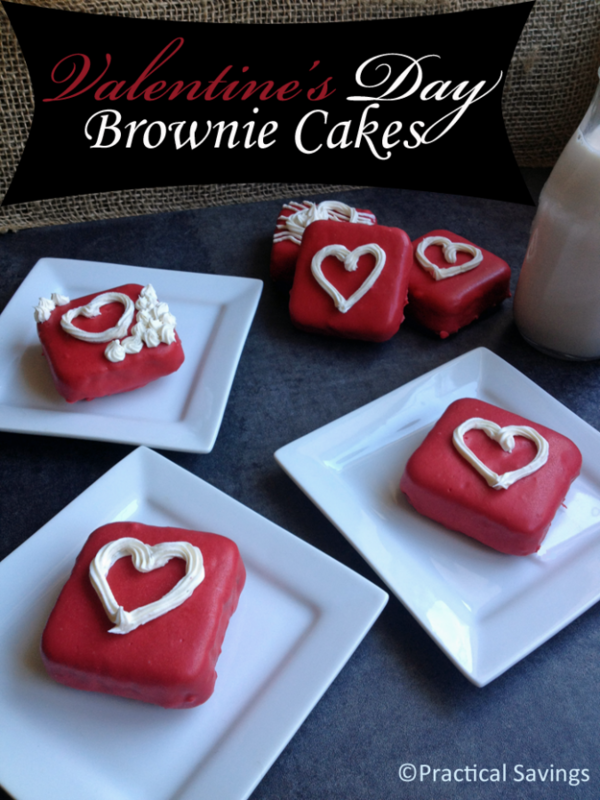 If I do, I’m making these very easy, very simple Valentine’s Day mini brownie cakes that I made last year. They were a hit among all my children and my husband. 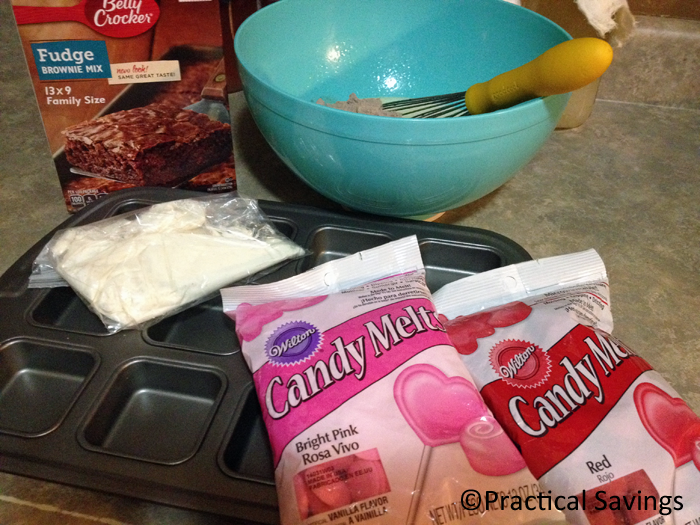 I have this great dessert bar pan, however, you could try this with just cut squares from a 9×13 pan. My only caution would be crumbs so I would chill the cut brownies before dipping. Melt your candy melts. Add some shortening or coconut oil if you need to thin them a little. 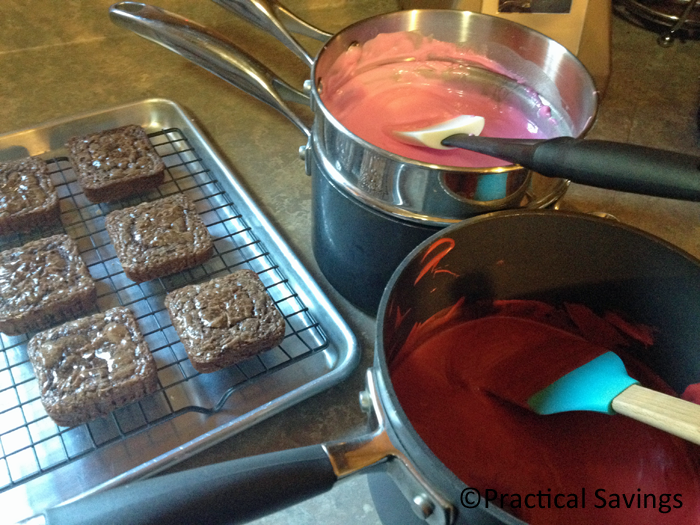 Fully immerse them into the melted coating, keeping the brownies top side down for a flatter surface. 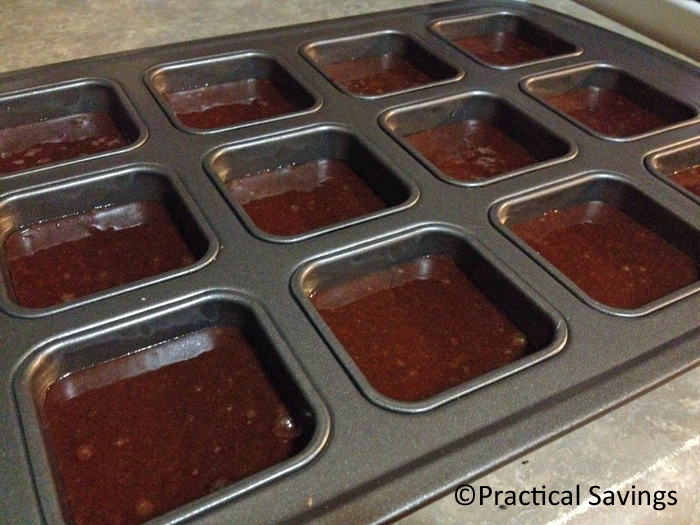 Lay them on a baking rack, still top side down, so the excess drips off. 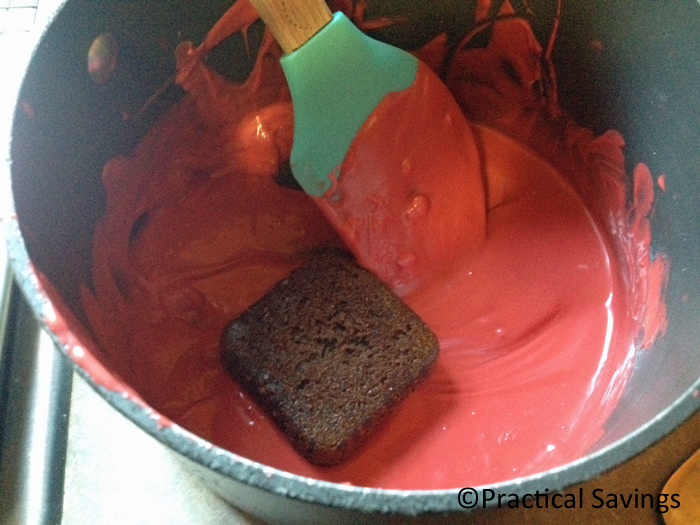 Once hardened, pipe a second color onto the mini cakes. Allow them to harden before serving. You could also use frosting but your hardening time will be longer. 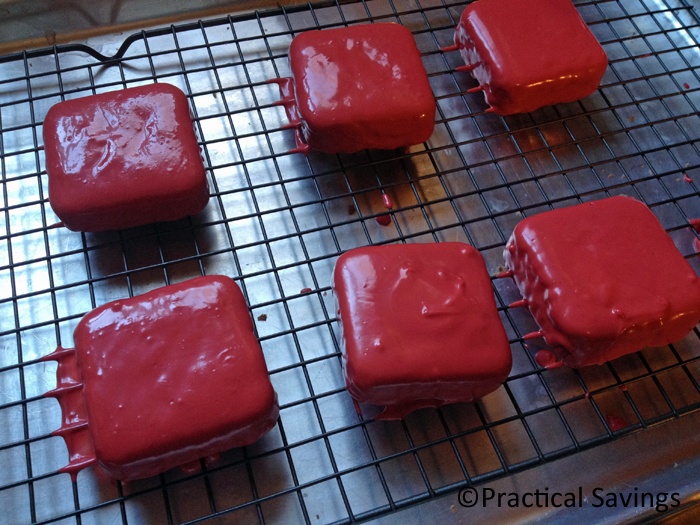 Using the candy melts speeds of the drying time as well makes them sturdier for transporting. Simple, right? 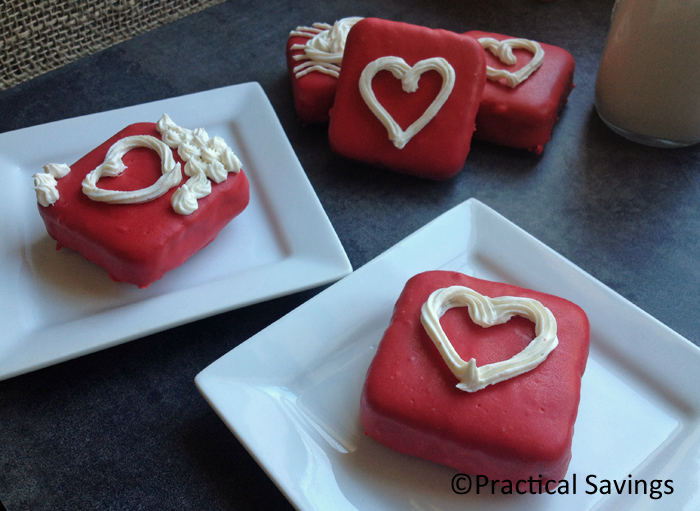 These make a great treat for after dinner, a great gift for Valentine’s Day parties or to take to a neighbor to let them know someone cares about them.